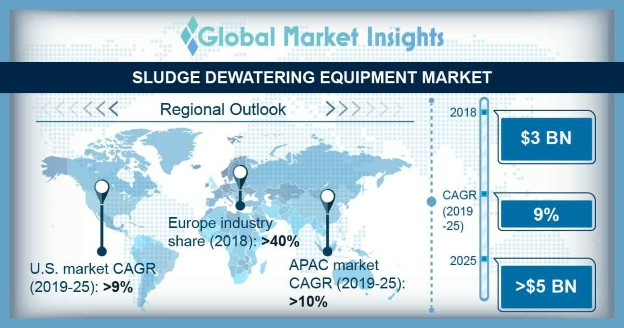 Sludge Dewatering Equipment Market size is anticipated to surpass USD 5 Billion by 2025, as reported in the latest study by Global Market Insights, Inc. Growing focus toward preservation of surface water bodies from contamination coupled with ongoing technological inclination to promote recycling and reuse will drive the market size. Shifting trends toward green and sustainable economy through closed-loop production, eco-efficiency and pollution control will further complement the industry growth. Germany market will witness robust growth on account of shifting trends toward resource recovery and wastewater recycling. In addition, stringent waste management and pollution control standards including the EU Urban Waste Water Treatment Directive (UWWTD) will further augment the industry share. The directive addresses the discharge, collection, and the treatment of the urban wastewater and has been implemented since 1991. The U.S. market size is set to grow over 9% by 2025. Ageing wastewater handling infrastructure along with rapid depletion of water resources will drive the product demand over the forecast period. Introduction of effluent discharge guidelines and standards across the nation will further complement the business growth. Clean Water Act (CWA) is one of the key policy accords undertaken by the federal government to ensure surface water quality and further regularize the effluent discharge. Municipal sludge dewatering equipment market will witness growth on account of limited availability of barren land for municipal waste disposal across metropolitan areas. Ongoing investment towards the establishment and upgradation of wastewater treatment plants will further boost the demand for these products. Moreover, paradigm shift toward recycling and reuse of municipal waste across key regions will positively influence the business landscape. China sludge dewatering equipment market is set to witness growth on account of growing investments toward establishment of new wastewater and industrial water treatment facilities. The country is characterized by an upsurge in wastewater generation from pharmaceutical and food processing industries. Stringent environmental regulation and pollution standards including the industrial wastewater discharge standards introduced by the Chinese Ministry of Environmental Protection, restricts water abstraction to promote recycle and reuse of industrial wastewater. Notable industry participants across sludge dewatering equipment market include Keppel Seghers, Suez Environnement, Evoqua Water Technologies, Kontek Process Water Management, ENCON Evaporators, Veolia, Alfa Laval, Hitachi Zosen Corporation, Huber SE, Flo Trend Systems, Andritz, Aqseptence, Phoenix Process Equipment, Flottweg, Hiller Separation & Process, Komline-Sanderson and Sebright Products.